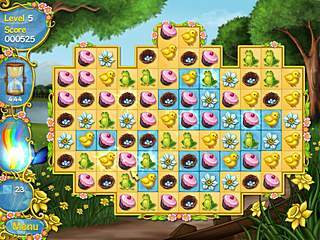 Spring Bonus is a newly released match-three game fitting into the bursting spring all around us. Not being a fan of this game genre, I really anjoyed the game. For a while at least. Mostly due to its simplicity and positive atmosphere. But the game is explicitely Easter-themed, so that kind of compensates for the lack of story. Usually you would expect the game to start with some kind of story. Mysterious, spooky and dark one work better for the hidden object/adventure genre. Enterprising skills are trained in simulation and time-management games. 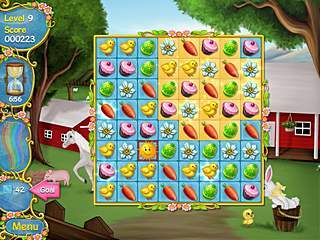 The match-three games usually feature some fairy tale story. This one goes without any story. But the game is explicitely Easter-themed, so that kind of compensates for the lack of story. If you try to leave, the crying Easter bunny will ask if you are sure because it desparately needs you. 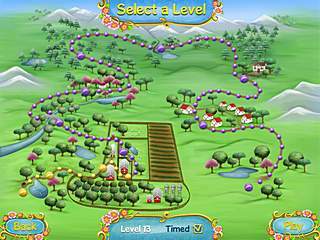 The game features very simple graphics. Following the marked path on a map, you will play several boards with one and the same background. Those backgrounds remind children books with those friendly nice pictures with trees and animals. You will play the pure match-three game. The follows the familiar pace - you are to make matches of three or more identical items. All of the items are cute Easter-themed animals or flowers or meals. You will be given a goal for every level. Usually it is to match a specific number of a specific item. The goals are easily reached even in the timed game mode. The game is so rich in all kinds of bonuses. They become more and more advanced as you progress. I'm more of a hidden object/adventer games fan, but it was fun to play this bright game full of this unrealisticly positive mood. All of the background scenes are available as desktop wallpaper. The game must be perfect for kids. This is Spring Bonus review. Download this game here.